A great way to repurpose misprinted leather labels that otherwise end up in a landfill - this large messenger bag is the mother of all brands. Works great as a bag for laptops, books, tablets, and medium to large personal effects. A small security flap hides a zipper pocket on the large flap closure secured by Velcro. Lined in denim fabric, the inside has a zipper that runs the length of the bag, creating a secure second storage. The dense cotton fabric strap adjusts to up to 55 inches long. The bag is 15 inches long by 12 inches high and 4 inches wide. Each piece is handmade from misprinted labels, actual designs and colors may vary slightly - the image is representative only. After much experimentation, the Conserve team hit upon the idea of not recycling, but upcycling by washing, drying, and pressing the bags into sheets. 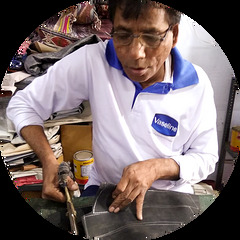 Handmade Recycled Plastic (HRP) was born and designs for handbags, wallets, shoes and belts quickly came flooding in. The challenge was obvious: Use high fashion to support better lives for the poorest and a cleaner environment for all.